Special Project: Fight For Soul Of Michigan GOP Is Waged Precinct By Precinct. Stan Grot can’t do an interview at the moment. He’s busy. 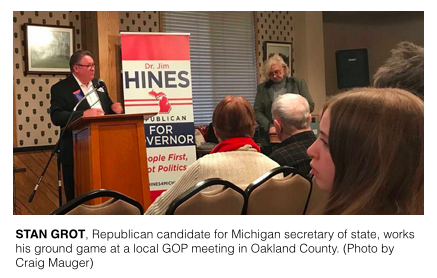 The North Oakland Republican Club just wrapped up its monthly meeting, and Grot wants to mingle with the people who could bring him a step closer to becoming Michigan’s next secretary of state. “I’m campaigning,” Grot says with a smile as he moves away from a reporter and toward a group of Republicans gathered at the back of the room. Grot, a political veteran and the current Shelby Township clerk, has been doing a lot of campaigning lately. But his strategy is different than the tactics of GOP contenders for governor. It has to be. 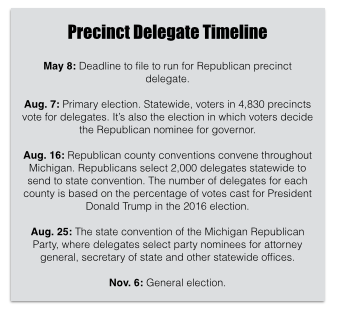 Within the Michigan Republican Party, nominees for secretary of state, attorney general, Michigan Supreme Court and university board positions are selected by delegates of the party’s state convention on Aug. 25. Those delegates help set the party’s future, and the quiet fight to decide who gets to be one of them in 2018 is playing out in small meetings like the one Grot is attending, at the Pontiac Country Club, in counties across the state. GOP candidates for secretary of state and attorney general are already out working for support among state convention delegates. Tea party groups want to increase their own numbers. And if the past is any indication, others will try to sway the process as well. If you want to watch the fight, look to the bottom of your ballot. That’s where the precinct delegates will be. The precinct is the smallest political unit in the country; it’s essentially a neighborhood. During the Aug. 7 primary, Republican voters will choose their precinct delegates. Some will win competitive races with hundreds of votes. Others could win uncontested races with just a handful of votes. Regardless of how they get there, the precinct delegates go to county conventions where they will select about 2,000 delegates statewide to attend the state convention. Delegates choose nominees for secretary of state and attorney general, a race that pits state Sen. Tonya Schuitmaker against House Speaker Tom Leonard. To the general public, the precinct delegate races fly under the radar. Delegate candidates don’t have to comply with Michigan’s campaign finance reporting requirements, meaning money in the races is undisclosed; and the groups that spend money to sway the races often do it in secret. But the races aren’t secret to everyone. Take Grot and his opponent, Treder Lang. She is a member of the Eastern Michigan Board of Regents, a certified public accountant and a former member of the state Republican Committee. Both Grot and Treder Lang have been working hard to recruit precinct delegates. One Republican activist described Grot as a “recruiting machine.” The activist said Treder Lang had been “everywhere” across the state. Both candidates want to get precinct delegates elected to then help get friendly state convention delegates elected. Their recruitment success could decide whether they’re on the general election ballot representing Republicans in November. 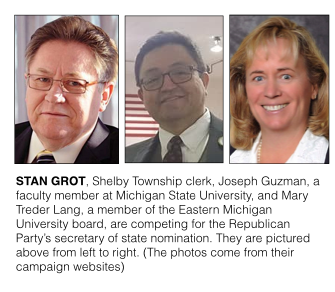 In the push for precinct delegates, Grot may have a bit of an advantage because he already holds a position within the Michigan Republican Party. He’s the chair of the 10th Congressional District GOP. He’s also from Macomb County, which will have the most state convention delegates in 2018 because it provided the most votes for President Donald Trump in 2016. For that 2016 election, Grot says he recruited 605 precinct delegates, which he describes as a record. Those delegates helped influence their friends and family and helped Trump win Michigan, Grot said. Grot won’t say how many delegates he’s recruited so far for 2018. The filing deadline for precinct delegates is 4 p.m. May 8. The set-up of having state convention delegates pick nominees for attorney general and secretary of state forces candidates to initially focus on their party’s core supporters. Because the secretary of state oversees Michigan elections, both Grot and Treder Lang have talked a lot about election integrity on the campaign trail. On March 22 at the North Oakland Republican Club, Grot gave an entire presentation on the topic of election fraud. He brought up allegations of people voting in multiple states and of dead people voting. “How many of you think that dead people are voting?” Grot asked the crowd. “I am from Chicago. I know,” someone in the crowd shouted back. Fights over convention delegates are nothing new. But 2018 could be different, according to Republicans. Tea party groups, conservative activists that often want to steer the GOP to the right, emerged in about 2009, just before GOP delegates selected their nominees for attorney general and secretary of state for the 2010 races. Those nominees have now served for eight years, and this year will mark the first time since that delegates will be truly empowered to select new candidates. Between 2010 and 2018, the Michigan Republican Party’s conventions saw two contested races for party chair — in both cases, tea party-backed candidates lost against candidates preferred by the establishment. The current party chair is University of Michigan Regent Ron Weiser. Some in the party believe Weiser won’t seek another term next year, meaning delegates elected in 2018 could have a say in deciding who will be the next chair, giving tea party groups their best opportunity to seize additional influence over GOP politics. Sarah Anderson, a spokeswoman for the Michigan Republican Party, said Weiser hasn’t made a statement on whether he will seek re-election. It will depend on the outcome of the 2018 election, she said. Convention delegates also get to nominate the governor’s running mate and in 2014, conservatives unsuccessfully tried to oust incumbent Lt. Gov. Brian Calley at the state convention over their frustrations with Gov. Rick Snyder’s centrist tendencies. Before that convention, there was a statewide effort to recruit delegates. At least two groups ‒ Michigan Advocacy Trust, an account connected to attorney Richard McLellan, and the Michigan Freedom Fund, a conservative organization connected to the DeVos family ‒ sent mailers to promote or recruit precinct delegates. Neither group had to disclose where their money came from for their efforts. The Freedom Fund, whose website says it wants “to create a grassroots movement in favor of our Constitutional rights,” is recruiting precinct delegates once again. 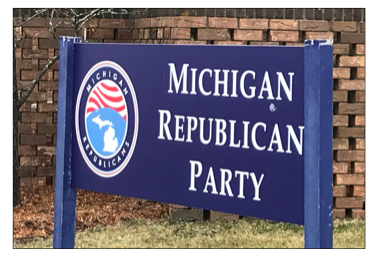 The Michigan Trump Republicans also are recruiting precinct delegates, said Marian Sheridan of West Bloomfield, a conservative activist and the group’s co-founder. Sheridan said she has concerns about Republicans who oppose Trump, or “Never Trumpers,” winning positions next spring that could allow them to be national convention delegates in 2020. “We want Trump’s agenda, Make America Great Again, to be throughout our state,” Sheridan said. Some see tensions between the tea party and establishment wings easing. They believe Trump, a favorite among many tea party backers, has alleviated some of the strife between outsiders and party leadership. Others say they’re waiting for disagreements to reemerge.They point to an ongoing lawsuit in Oakland County between conservatives and the county party over how the county party selected its leadership. Regardless, interest in precinct delegate positions is on the rise in many areas of Michigan. In Oakland County — often seen as ground zero for delegate fights — the number of people running for precinct delegate jumped 19 percent to 1,119 from 2012 to 2016 even though there were fewer positions available. Precinct candidates have already started filing to run. Terry Whitney, an IT professional and a candidate for Michigan Senate, was among the first to do so in Oakland County.